This weekend’s Free Practice saw Mercedes struggling. With Hamilton’s time just not up to par, and Bottas with the loss of hydraulics in FP3, some Ferrari fans were crossing fingers and praying to the F1 gods. But, ‘Practice” is just that. Practice. And those struggles didn’t follow into today’s Qualifying session, much to the dissappointment of Vettel fans. Q1 had few surprises. Although Verstappen had led all three FP sessions, again, it was only practice. When it counted in Q1, he finished third behind Mercedes’ Bottas and Hamilton respectively. Ricciardo placed fourth, with Vettel and Raikkonen finishing out the top six. There was some late round excitement with Alonzo surging up at the very end of the session, after posting no time throughout. However, although he initially surged to 7th place, late times posted from the rest of the grid ultimately bumped him to 14th. Still, that’s enough to go through to Q2, so congrats are in order! Eliminated in Q1 were: Vandorne, Magnussen, Stroll, Sirotkin and Grosjean. No real surprises there. The difference between the power teams, and the lower grid are so marked, one wonders sometimes why they don’t just skip to Q3 with Mercedes, Ferrari, Red Bull, Force India and maybe a coin toss for Renault and Sauber. Anyway, I digress. Q2 had a little more buildup. 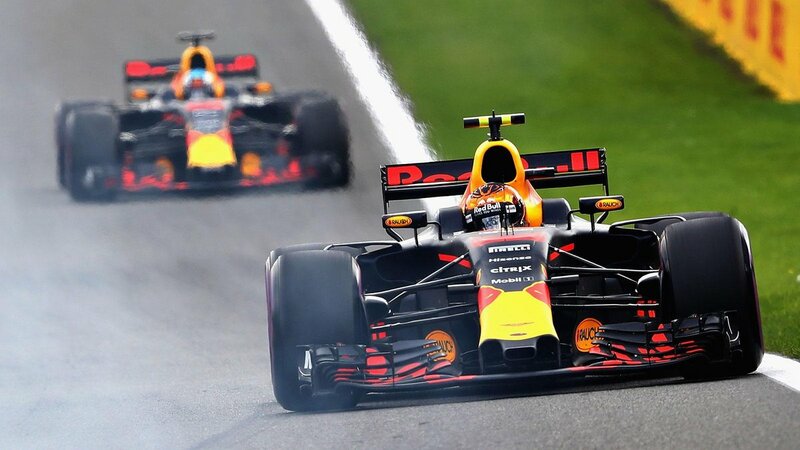 Verstappen was again on point, taking provisional pole, followed closely by Hamilton and Vettel, with Ricciardo, Bottas and Raikkonen rounding out the top 6. Alonzo couldn’t quite make the cut to Q3, though I was rooting for him; along with, I’m sure, countless others. Next season just wont be the same without his colorful presence on the grid and in interviews. Following Alonso in eliminations were both Ocon and Perez, as well as Hartley and Gasly. Q3 was where the excitement really came into play. With all eyes on the Fight for Five and likely Hamilton’s fifth title on the horizon, Vettel fans everywhere were heartened by the struggles Hamilton went through in practice. To say nothing of the imagined potential for some type of failure when Bottas lost hydraulics. But again, that was Practice, and as qualifying progressed, it became apparent Mercedes had worked out all the kinks. Hamilton had a good shot at Pole if only he could surge by Verstappen. Q3 opened with Vettel first up to provisional Pole. But he was quickly eclipsed by Verstappen, leading Seb’s time by a blistering 0.185. Still, despite all the buildup for Verstappen’s potential to take the youngest Pole Sitter title from Vettel, it was Ricciardo, out of nowhere, who pulled out a stellar Pole qualifying laptime of 1:14.759. Danny hadn’t been on anyone’s radar really, through the sessions today. But he got everyone’s attention when he blew by Versappen’s time. Verstappen took P2 with 1:14.785, giving Rebull their first P1, P2 lockout since the US grand prix on 2013. Dan and Max are followed by Hamilton with 1:14.894, and Vettel at 1:14.970. Bottas and Raikkonen finished the top six grid positions, with no one surprised by Renault’s Hulkenberg and Saiz, right behind. Leclerc and Ericsson complete the top ten. I was pleasantly surprised by Verstappen’s good sportsmanship as a beaming Daniel waved to the crowd after his Pole lap. I’d honestly expected a sullen, pouty response from Max after all the hype thrown his way about his potential for Pole. But he was mature and seemed genuinely congratulatory for Ricciardo as he shook hands and offered congratulations. Daniel was all smiles, of course, as he interviewed and bounced with excitement (and it was lovely to see after the heartbreak of his DNF after Austin). Tomorrow is anyone’s game. While Ricciardo has Pole, and is a seriously underrated driver, he is plagued by hardship and whether his car will make it to the end of the race is anyone’s guess. As long as Ricciardo’s car holds up, if he can get through laps 1 and 2 safe, he has the potential to out drive anyone on the grid. However, despite today’s maturity and calm from Max, lining up next to Verstappen on P2 is always a risk. That young man is impatient and sometimes careless, so lap one tomorrow could be anyone’s to lead. Along with Verstappen, hot on Ricciardo’s tailpipe will be Hamilton and Vettel. Hamilton may feel pretty secure in his chances to secure the championship title tomorrow, but he’s not likely to pull over and let Vettel by, and Vettel needs this win to stay alive. With the cloud of errors and bad luck following him around the last few races, it could be quite an opening lap. Of course, on Race Day, anything can happen. From gremlins compromising Hamilton’s hydraulics or power unit (it CAN’T only happen to Ricciardo, right?) to Vettel’s nerves causing a overcorrection or higher risk taking, to Verstappen’s temper or lack of caution, anyone could end up knocked out-of-place, or DNF, leaving the outcome very much up in the air. A safety car in the right lap could upend everything. Tomorrow has the potential to be a real nailbiter of a race. Here’s hoping.